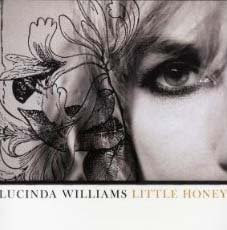 Concurrent with her current tour, Lucinda Williams has released "Little Honey." This is a curious choice of title. It could refer to a person of diminutive proportions fondly referred to as "Honey." It might just mean that she has little honey left in her bear package. 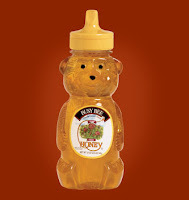 Or, perhaps it refers to her current love, who she sings of not as a honey bear, but a little "honey bee." However cute and endearing that may be, her past suggests that this is but another temporary sidestep on her road to disappointment. "Lotta Honey," after all, seemingly will never apply to Ms. Williams' love life. And for me, that's okay. Her gift is wrapping her experiences in song, and when she hurts, she writes better. Here, we have what seems to be a much more positive album than all of her previous. We start off with "Real Love," an okay rocker with a refrain of "I've found the love I've been looking for, a real love, a real love..." Regrettably, that song was written about her previous stop at love's door. "Tears of Joy" better captures her sense of new found love, as she pulls out the, er, difficulties of her past in contrast to the new hope that she now has. It's well written, but... there remains a sadness in the tune. And "Knowing" sounds like a song that wants to sound happy but just can't step up to uncharted space. "If Wishes Were Horses," she'd have a farm. And so would every other young girl. And so it goes. Overall, this CD is okay. Lucinda knows how to work blues scales and instrumentally find something "good." But still, there's a lot of retread here. There's the obligatory "adult" themed song - "Honey Bee," there's the annoying song - "Jailhouse Blues" (good for 1-2 listens, but then a misfit on repeated listens), and songs that pretty much sound the same as songs she's done as well or better in the past. "Circles and X's" is itself an old idea that she recently completed, and several others closely follow the minimal strum-and-sing formula of many songs past. This can be quite good - "Well, Well, Well" or it can be ho-hum - "Rarity" - within which is the CD title reference. The reading fares better than the listening, however. Still, there is much here to like, and although a cover of AC/DC's "It's a Long Way to the Top" seems a disjointed afterthought, it's is a good way to depart this CD. There's an enthusiasm that she fails to capture in her own songs, and it's played with a Keith Richards/ Ron Wood aggressiveness. Suggested Songs: "Well, Well, Well", "Jailhouse Blues" (one listen), and "It's a Long Way to the Top". Note to the unacquainted: Lucinda has a Southern "hick" accent, which should not be confused as a twang, a drawl, or other inflection coming from the studios in Nashville. She doesn't attempt to hide her accent, and if you hear one of her songs, it's more likely another artist covering it. Example: "Passionate Kisses" by Mary Chapin Carpenter. For those who do I-tunes or similar source, my favorite Lucinda song is "Side of the Road," which takes an observation and pairs it with appropriate instrumentation as well as any.